Rob Carter’s Metropolis is a trend trifecta: cartography, cut and folded paper, and urban history. Architecture videos–when they’re good–can be jaw-dropping. But that’s usually because they look so fantastic: realer than real, whether renderings or film, they turn buildings and cities into exaggerations easier to love or hate. Carter (British-born, Brooklyn-based) took a different approach. Metropolis is an animated history of Charlotte, North Carolina made from a sequence of aerial pictures layered on top of each other. 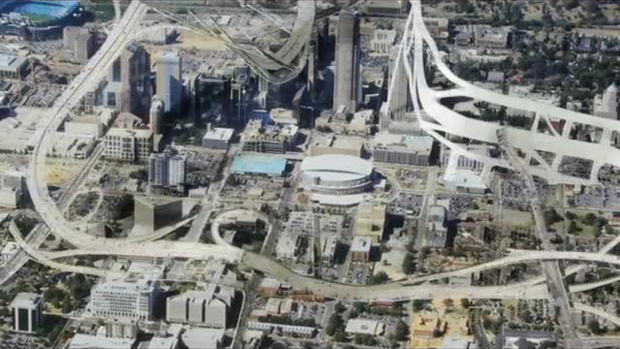 It’s Manahatta as pop-up book, transforming Charlotte from Native American trading post to cotton-age boom town to tower-spiked banking hub in just a few folds. The paper conceit ultimately works because of how well it represents the way cities feel, if not how they actually evolve: buildings pop up out of nowhere, neighborhoods encroach on other neighborhoods, parks grow and are paved over. The medium is, well, you know… Check out the last three minutes of the film in big-screen HD on Vimeo, or the whole thing streaming on Carter’s site.